The White Wolf Lodge isn't nearly as posh or cozy as its name might imply, but it is in an enviable location, two miles off the Tioga Road next to the Harden Lake trailhead and the western Lukens Lake trailhead. The lodging consists of 24 tent cabins and 4 highly prized wooden cabins. The tent cabins, which sleep four, have canvas walls and ceilings and lack plumbing or electricity; heat is provided via wood-burning stoves. The wooden cabins, the most decadent lodging for miles in either direction along the Tioga Road (it's not a crowded field), include electricity, propane heat, private bathrooms, a pair of double beds apiece, and maid service. The lodge also has a small restaurant and a smaller general store - so small, in fact, that there's not room for both you and the proprietor inside; instead, you get to stand outside and point out the items you want. Adjacent to the lodge is the White Wolf Campground, which has 74 first-come, first-serve campsites at $18 apiece (more info). Would-be White Wolf campers are generally advised to arrive early in the morning to get in line for potential vacancies. 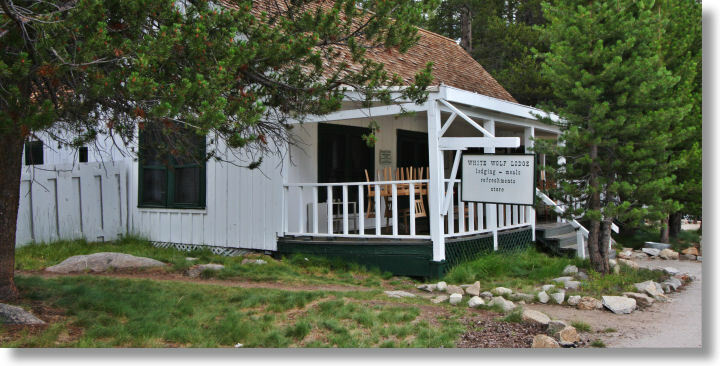 The White Wolf Lodge and Campground are subject to the same seasonal closures as the Tioga Road (see its historical opening and closing dates), and in fact usually close before the Tioga Road does and open afterwards. If you want to stay at the lodge, don't show up without a reservation, and before you get up in the pre-dawn hours to queue for a campground site, check the campground's prospective opening and closing dates.